Stomp the Blues Tonight! is Duke's Blues masterpiece featuring 16 tracks of rockin', jumpin' and swinging blues featuring Duke with Doug James, Sunny Crownover, Bruce Bears, Rich Lataille, Al Basile,Carl Querfurth, Marty Ballou, Jon Ross and Mark Teixeira. Blues fans don't miss this one! Tracks include: Stomp The Blues Tonight!, Do Me Right, Three Hours Past Midnight, Baby You Don't Know, I Wanna Hug You, Kiss You, Squeeze You, Frankie and Johnny, Look But Don't Touch, Playful Baby, Million Dollar Secret, Jumpin The Bone, Hands Off!, Money's Getting Cheaper, For You My Love, Tore Up, Ain't Nobody's Business, Early In The Morning. 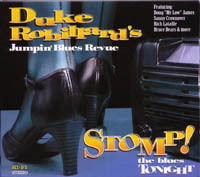 A homage to Duke's early R&B influences, */Stomp, The Blues Tonight!/* is bound to be an instant classic!